For part 1 of this project, click here. 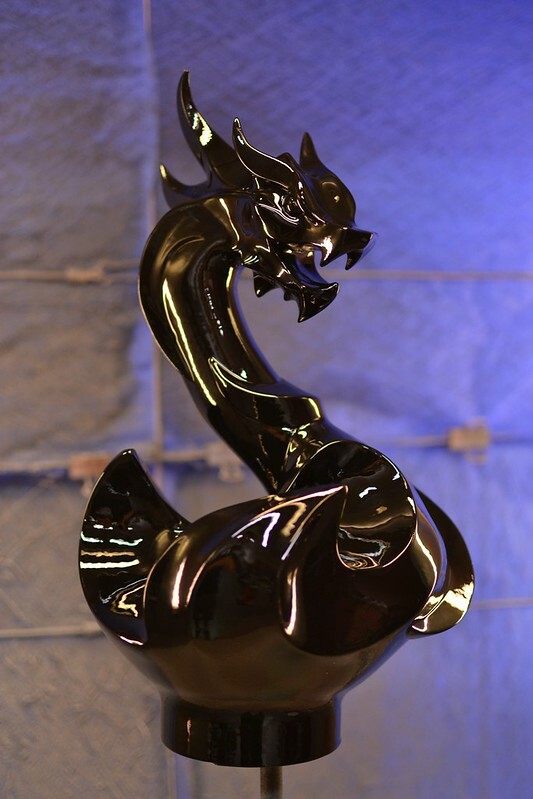 At the end of part 1, the main sculpt of the dragon was finished, clearcoated and ready for molding. 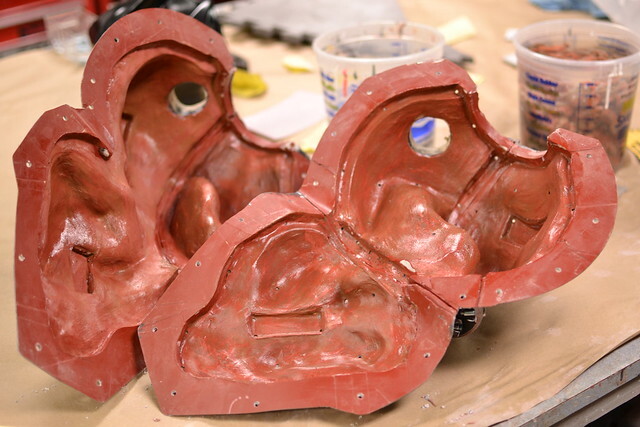 The finished castings would need to be pressure cast in order to make them completely clear, so the mold itself would have to be constructed in a very specific manner. Pressure casting involves taking a mold and placing it into a large sealed chamber specifically meant to be pressurized. 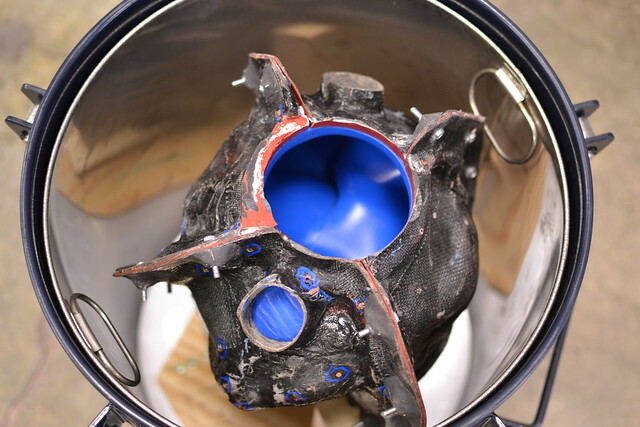 After resin is poured into the mold cavity, the chamber is sealed and pressurized to around 55-60psi. Since gasses can be compressed but liquids cannot, pressurizing liquid resin causes all voids, bubbles and air pockets to collapse and leaves the casting free of any trapped air. 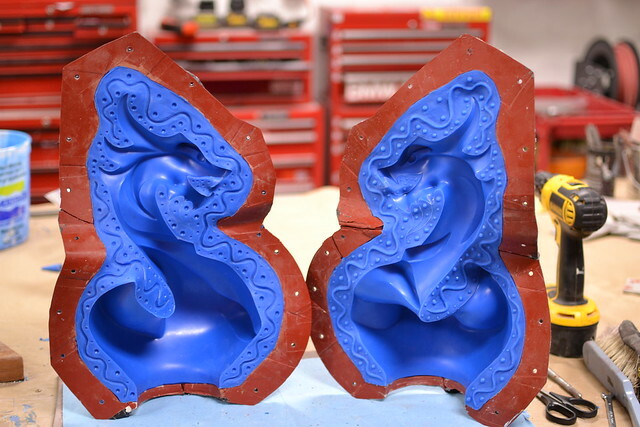 This means that the silicone mold itself must also be free of any trapped air, since small bubbles in the mold will be affected by pressure and will deform the mold surface. 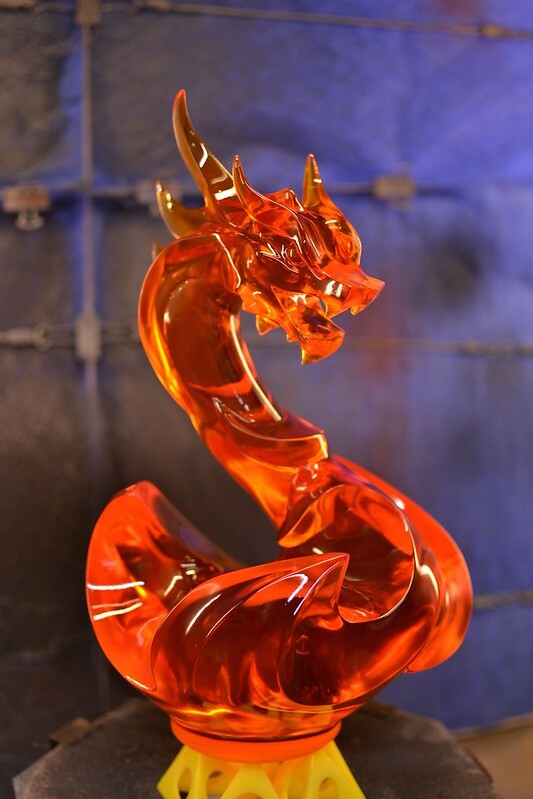 The short version of this is that the dragon would have to be matrix molded. 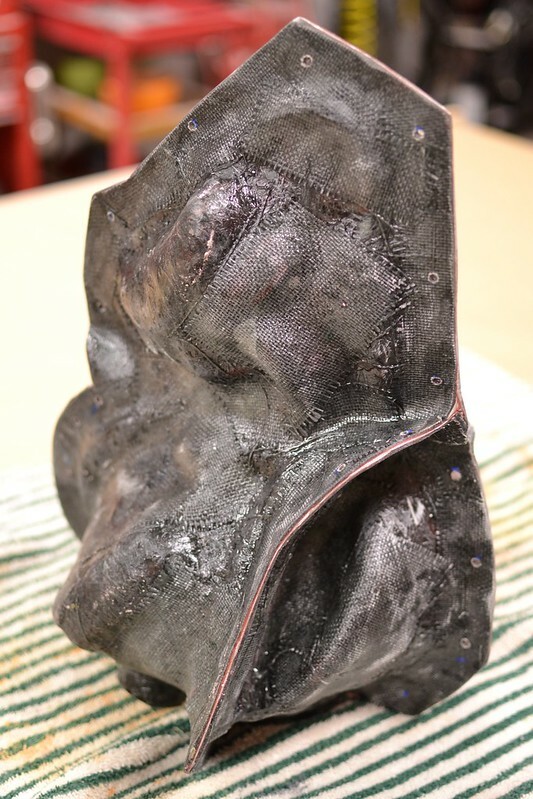 In matrix molding, the mold jacket is made first then the master sculpt is placed into this shell and the void between the sculpt and jacket is filled with silicone. This allows the mold material to be vacuum degassed, removing any air pockets and leaving only the liquid rubber material. 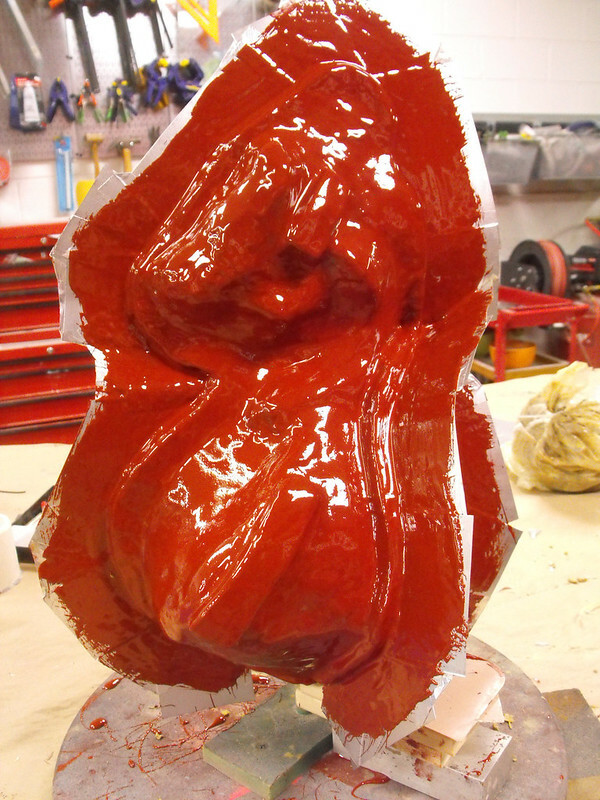 First, the mold master is wrapped in plastic then sculpted over with clay that represents the final shape of the silicone material. 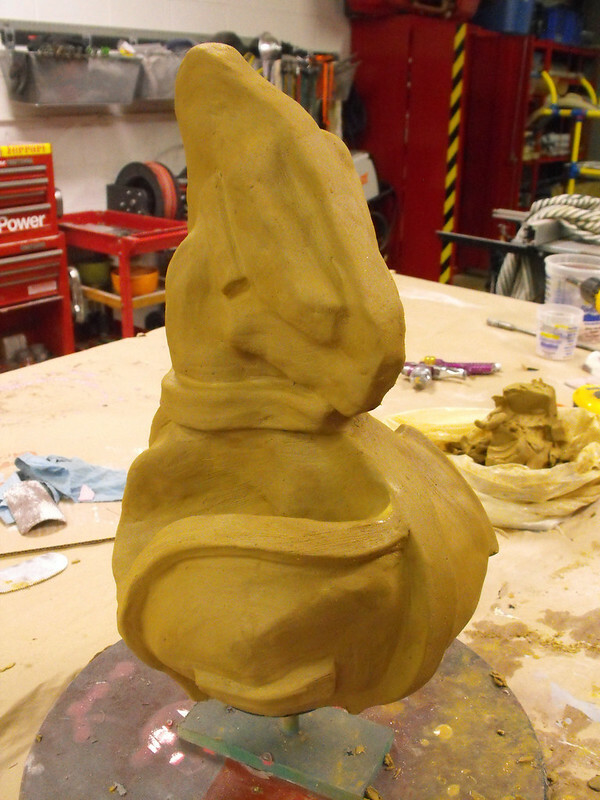 Water clay works best, though try to avoid WED clay as it’s more difficult to sculpt rapidly into shape. 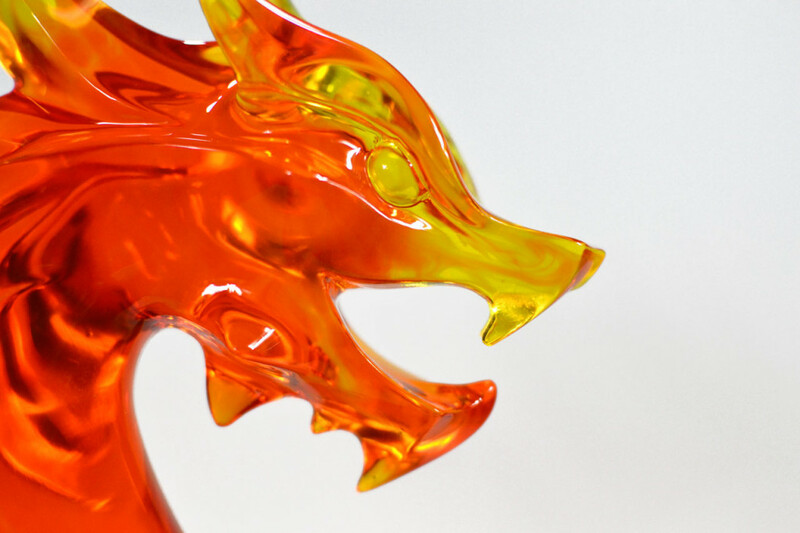 You can see I’ve also sculpted in registration keys as well as the parting seam line along the head crest of the dragon. It’s a good idea to take a plastic toothpick and check the depth of your clay from the master sculpt, to make sure there aren’t any thin spots. Parting seams are added in, using aluminum roofing flashing panels pressed into the clay. The sections where these panels overlap are stuck together temporarily with aluminum ducting tape. After the clay and parting seams are added, the entire piece is clearcoated with acrylic spray clear then waxed with sonite. This seal makes it easier to clean the clay out of the inside of your mold jacket once complete. The process of adding a jacket is similar to a brush on mold. For this piece I started with EpoxaCoat Red as a surface print coat layer to capture all of the detail of the clay. Epoxy is great to work with here as it has a long working life but won’t run off vertical surfaces. In order to make the mold jacket completely rigid, EpoxaMite 102 was layered over with glass fiber cloth to build up a thickness of about 1/8″. Three layers of glass cloth on the main body and four along the seam lines ensure nothing slips out of place. After letting the epoxy dry overnight, the seam lines are cut smooth and sanded to remove any sharp edges. Holes are also drilled in seam flanges so the jacket can be bolted back together later. Here’s the finished jacket after cleaning out the water clay. In order to keep the jacket from locking into the silicone it was split into five sections. There are a lot of undercuts to this sculpt that necessitate a fairly complex set of seams. 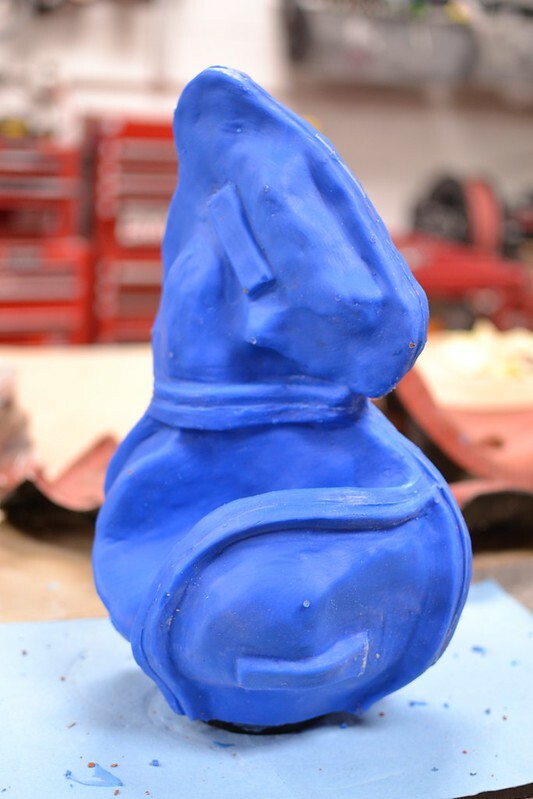 In order to make a parting seam for the silicone, the master sculpt was embedded into clay in one half of the mold jacket. Registration keys and lines were sculpted into the clay before the jacket was re-assembled fully. I used Mold Star 30 for this mold – it’s a very thin silicone that degasses easily and works great for matrix molds due to its low viscosity. 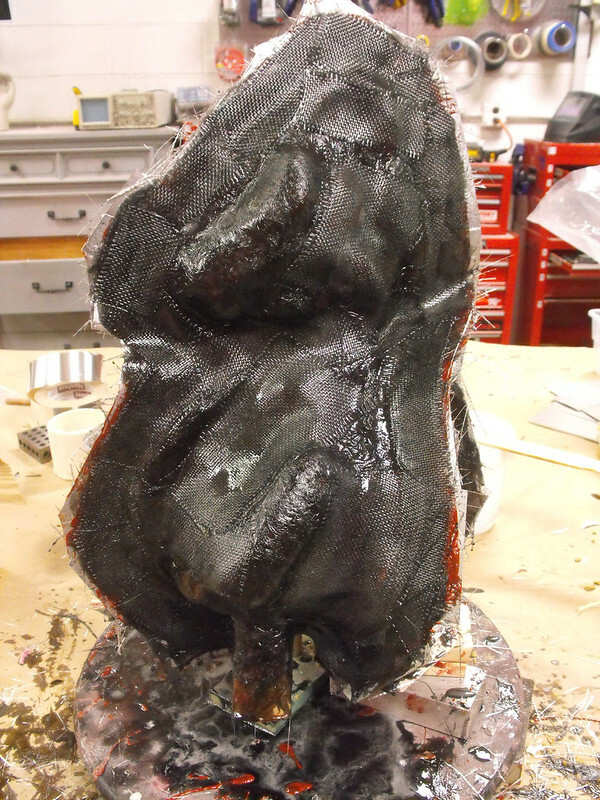 This is one half of the mold after curing and removing the previously clayed-up side shown in the step above. 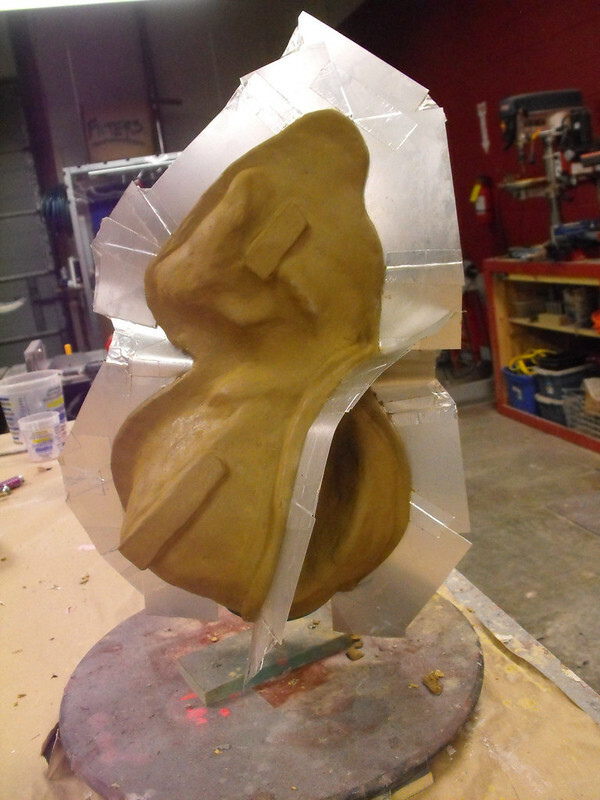 Here’s the finished silicone mold with the mold jacket removed. You can see how this parallels the water clay sculpt I made earlier. And here’s the beauty all opened up! 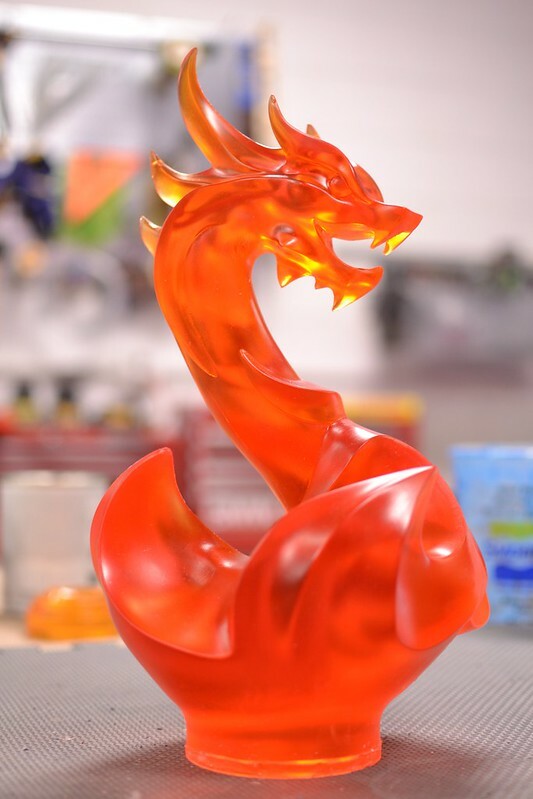 I’m quite proud of this mold, definitely one of the better ones I’ve built over the years. 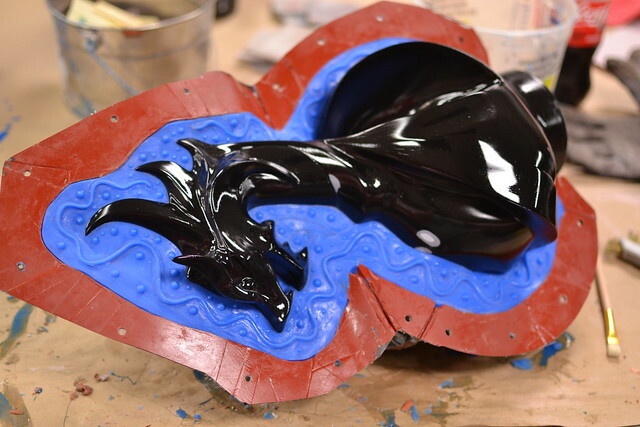 This mold was then plunked into my massive pressure casting chamber to pull copies of the dragons. Each casting takes 96oz of Smooth Cast 326 (a slower setting version of SmoothCast 325, which allows me to fill the mold and pressurize the tank without the resin curing mid-process.) I split this into two pours – one half is 48oz of resin tinted orange and the other is 48oz tinted yellow. By alternating the pouring of the resin batches I can control a bit of gradient shift in the finished castings. 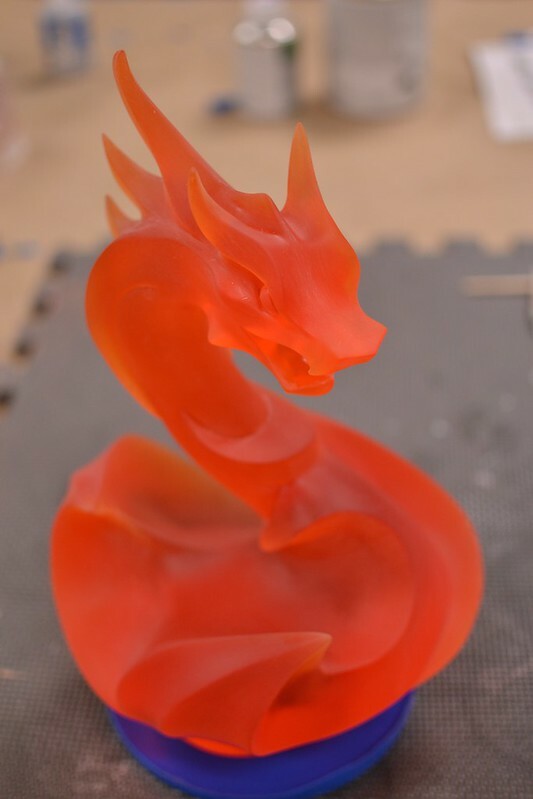 The castings come out very smooth and clear, but the surface has a bit of orangepeel on it from the mold release used during the casting process. This is sanded off and the whole casting is wet-sanded to 400 grit to even out the surface and remove any visible seam lines. 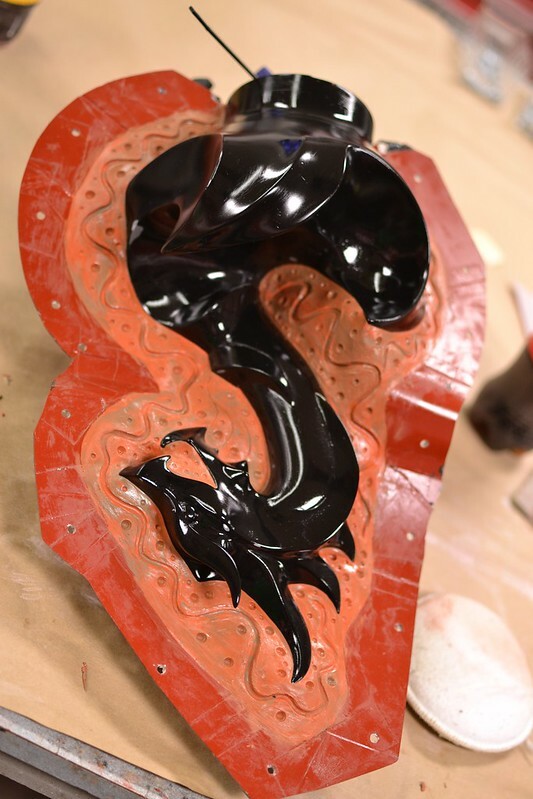 Each casting is then sprayed with three coats of gloss urethane clearcoat to get things nice and shiny. This whole process takes a while, but the results are worth it. I also made a large disc casting to serve as the base. 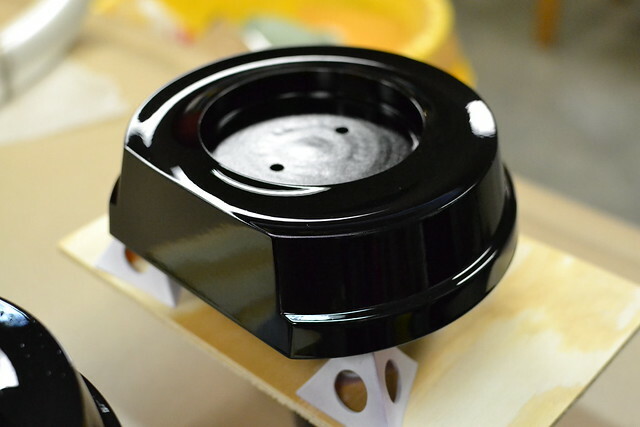 Nothing too fancy, just a simple block mold which was cast in black tinted 326 resin then gloss clearcoated. 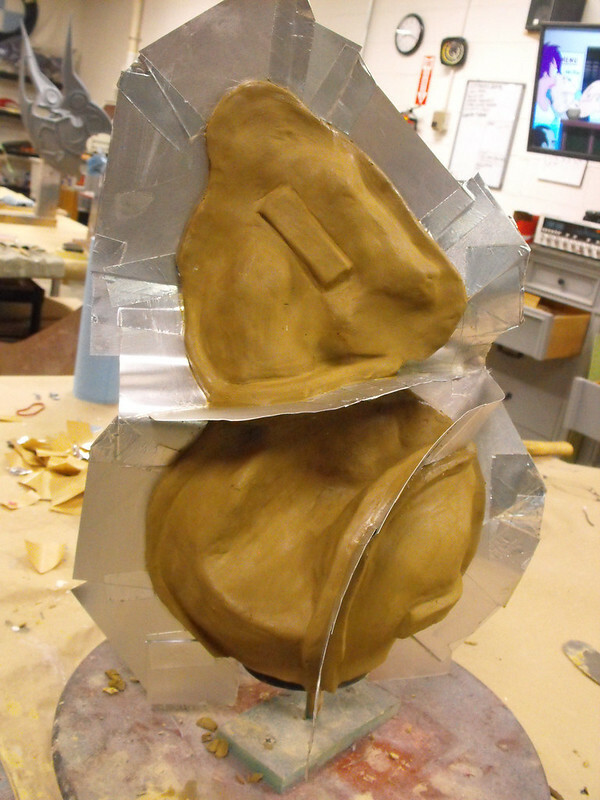 Castings are secured to the bases with two acrylic rods and some thickened epoxy resin to keep things in place. 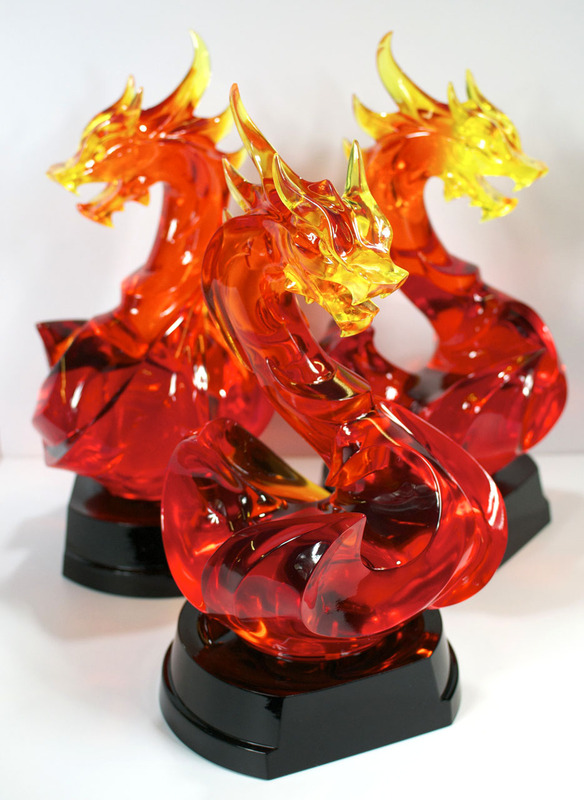 All told I made nineteen copies of the Curse dragon as awards for employees who had been with the company for five years or more. Later on this year I’ll be sorting out their ten year awards, so check back later to see what happens! Here’s a few shots of the finished castings. 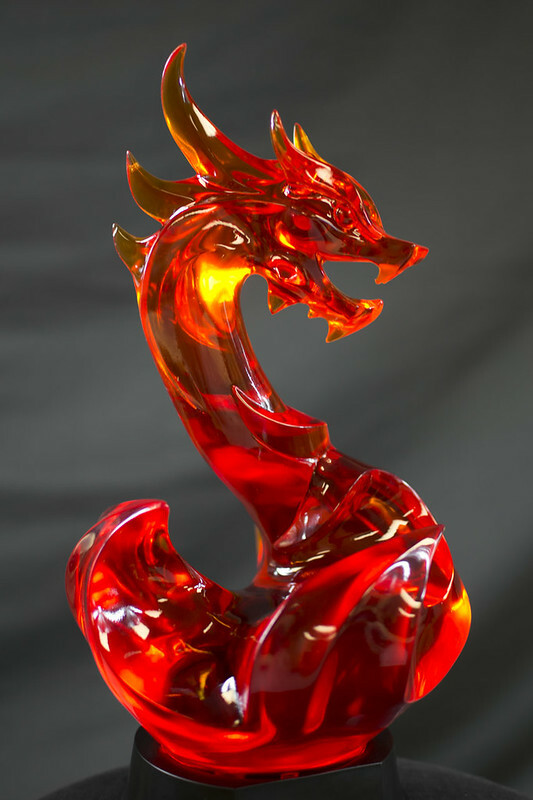 They’re about 14″ tall and weigh around 9lbs per piece. If you’re interested in seeing more progress photos, you can always check out my flickr for bigger photos and more detailed descriptions. 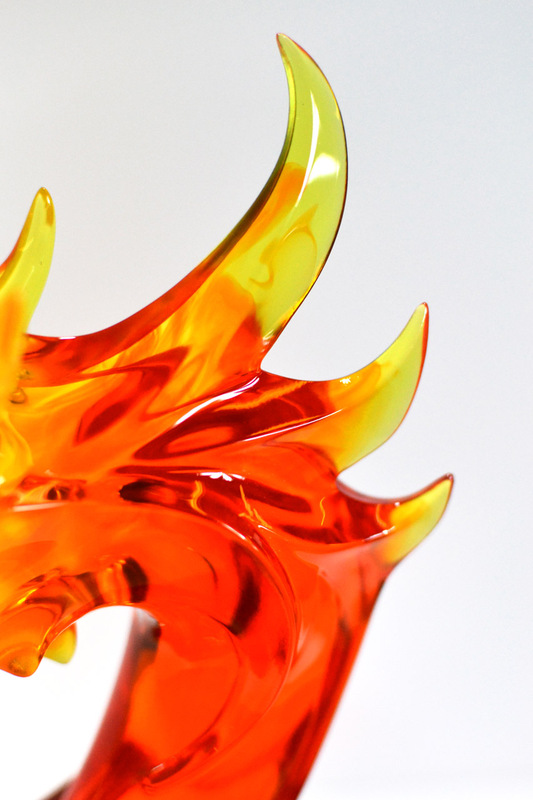 Thanks for reading, and check out higher res shots of the finished product in my portfolio!